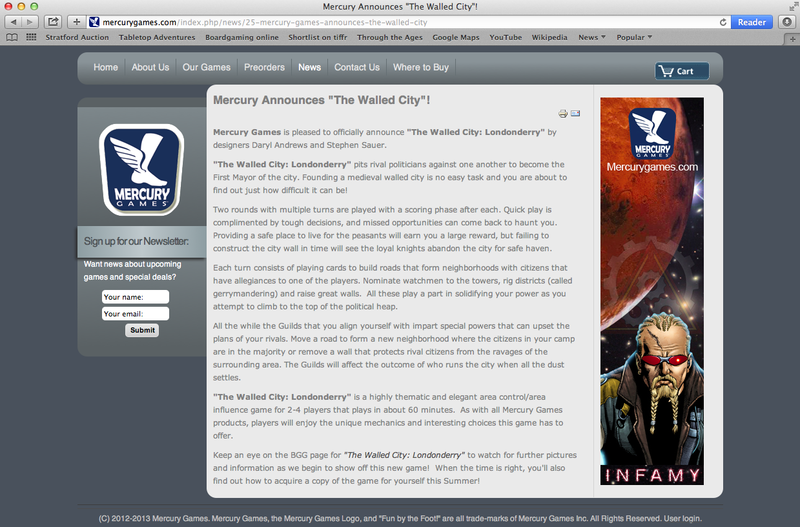 Mercury Games is pleased to officially announce "The Walled City: Londonderry" by designers Daryl Andrews and Stephen Sauer. "The Walled City: Londonderry" pits rival politicians against one another to become the First Mayor of the city. Founding a medieval walled city is no easy task and you are about to find out just how difficult it can be! Two rounds with multiple turns are played with a scoring phase after each. Quick play is complimented by tough decisions, and missed opportunities can come back to haunt you. Providing a safe place to live for the peasants will earn you a large reward, but failing to construct the city wall in time will see the loyal knights abandon the city for safe haven. Each turn consists of playing cards to build roads that form neighborhoods with citizens that have allegiances to one of the players. Nominate watchmen to the towers, rig districts (called gerrymandering) and raise great walls. All these play a part in solidifying your power as you attempt to climb to the top of the political heap. All the while the Guilds that you align yourself with impart special powers that can upset the plans of your rivals. Move a road to form a new neighborhood where the citizens in your camp are in the majority or remove a wall that protects rival citizens from the ravages of the surrounding area. The Guilds will affect the outcome of who runs the city when all the dust settles. "The Walled City: Londonderry" is a highly thematic and elegant area control/area influence game for 2-4 players that plays in about 60 minutes. As with all Mercury Games products, players will enjoy the unique mechanics and interesting choices this game has to offer. Keep an eye on the BGG page for "The Walled City: Londonderry" to watch for further pictures and information as we begin to show off this new game! When the time is right, you'll also find out how to acquire a copy of the game for yourself this Summer! Board Game Bash a huge success!